A retrospective of his work in the animation industry, which began with ‘Who Framed Roger Rabbit’ in 1986 to ‘The Little Mermaid’, ‘Beauty and the Beast’, ‘Aladdin’, ‘The Lion King’, ‘Pocahontas’, ‘Quest for Camelot’, ‘Space Jam’, ‘The Iron Giant’, ‘Spirit, Stallion of the Cimarron’, ‘Saving Santa’, ‘Igor’, ‘The Hero of Color City’ and ‘Bunyan and Babe’. 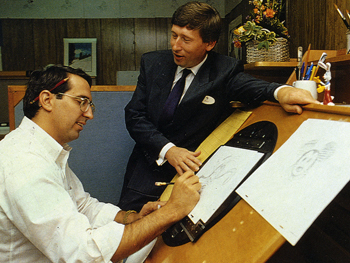 Max has served as an executive and producer at Walt Disney Feature Animation, Warner Bros. Feature Animation, DreamWorks Animation, and he is currently executive producer on 100% Wolf, an animated feature film being produced in Australia by Flying Bark Animation Productions. In addition, Mr. Howard’s humanitarian work with UNICEF produced films that utilized animation to deal with health and social issues in developing countries - from Burundi, Sudan, Ecuador and the island countries in the Caribbean. The presentation covers the effect of the films on international culture, the power of animation as an educational tool, and the timelessness of the art form. From his start in the entertainment industry as a child actor to his successful career as a director and producer all in the British theatre scene to his transition to animation producing, his relocation to the United States and his subsequent decision to become a citizen of the United States of America. Hear how this eclectic background has provided a unique skill set that has allowed Max to work in over 20 countries on numerous films and theatre productions and teaching seminars. Max holds a rare distinction of being a member of both the British and American film academies.